The West Virginia Department of Education hosted a public forum Tuesday night at Wheeling Park High School to know what the public thinks about the state’s schools, and what should be done to better education in the state. Participating in a discussion about instructional quality are, clockwise from left, Pat Jeffers; Liz Prather; Oliver Ho from the West Virginia Department of Education; former Regional Education Service Agency Director Nick Zervos; teachers Helen Bradley, Donna Carnes and Jessica Broski-Birch; and Delegate Lisa Zukoff, D-Marshall. 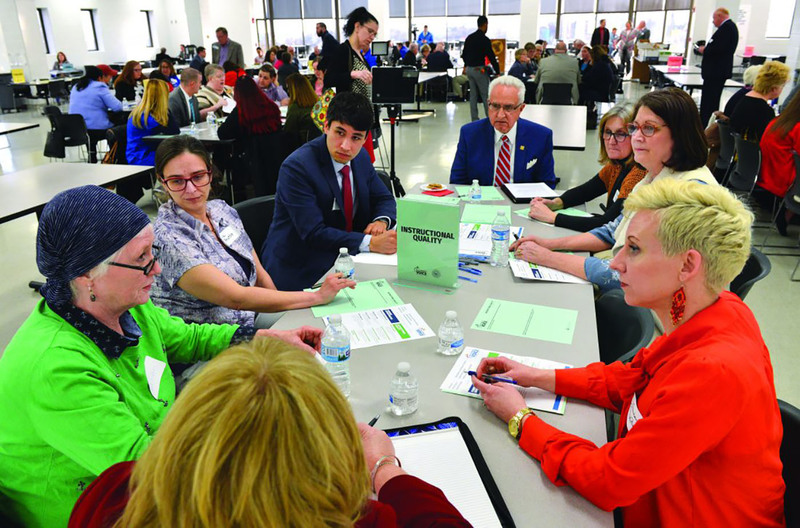 WHEELING, W.Va. — Northern Panhandle residents weighed in Tuesday night on what the West Virginia Legislature can do to improve education, with some thinking elected state leaders shouldn’t even be involved with passing public school reforms into law. The idea came up during a discussion at a table involving members of the Ohio County Democratic Women’s Club, including Teddy Grogan, Marlene Midget and Barb LaRue.